We have a 6 month old blue nose pit and she suffers from separation anxiety. She has basically destroyed our condo but we love her still. Wondering if adopting a cat would be the ticket to alleviating her stress when we are gone. She has not had good experiences with other small dogs as they jump and try to bite her which makes her get agressive with them. She also did not like another 18 mo old female pit but that one bit at her first. She does get along very well with our friends 90 lb. rotty (who is also female). We don't want to get another dog (especially a male) as our place is too small but we would consider a cat if she would like it. I wouldn't recommend you adopt a cat to relieve your pit's separation anxiety. Ellie may or may not get along with a cat. And if she doesn't, then what? You've taken on the responsibility of an additional pet and no one's really the happier for it. To my mind, it only makes sense to adopt a second pet if YOU really want one. And, if you do, bear in mind that if they don't get along you'll need to keep them separated. I would recommend that you address Ellie's separation anxiety directly. She's still a puppy and she may calm down as she matures. But in the meantime, there are some things you can do that might make her more comfortable. Have a vigorous walk or play session before you will be away from her. The idea is to tire her out so that she will be more likely to sleep at least part of the time you are gone. Make sure she has some interesting toys available. Nothing that she could choke on while you're gone. But, some things to keep her entertained. Consider picking up a copy of I'll Be Home Soon - How to Prevent and Treat Separation Anxiety. It's an excellent little booklet on helping your dog be happier and keeping your possessions intact when she's home alone. Another 'comfort measure' that has gotten rave reviews is Through a Dog's Ear - Music to Calm Your Canine Companion VOL. 1 Audio CD. This is classical music that has been psycho-acoustically designed to produce deep relaxation in dogs. In clinical tests on 150 dogs, it induced calmness in 70% of shelter dogs and 85% of dogs living in a household. Good luck, Jill. Ellie sure is a cutie. Feel free to post back here and let us know how it's going. I agree with Gale! Adding another pet may just cause more trouble. You should only add another pet if you really want one, & even then you should add a male. Two nearly same age/same size females are a bad idea. You may find yourself breaking up fights regularly. The best addition would definitely be a male, but your female should be spayed & your male should be neutered (just as all non show quality animals should be. Having them both altered would better ensure that they get along & of course keep you from having 8-12 puppies running around your place going nuts! Hi there - Thank you for your comments. 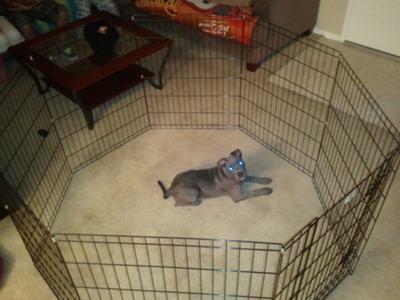 I am going to get another crate and see if I can make it more inviting that the last one I had for her.